The last thing you want to do while unpacking your dorm essentials in your new college dorm room is to create a junk drawer. You don't want to have to search through plenty of small dorm items like art supplies, desk accessories, and cosmetics just to find the one dorm item you need at the moment. That and you may not have the drawer to create the junk drawer. Keep your small dorm necessities organized and avoid creating a haphazard junk drawer with our Fuchsia Pink Texture Rounded Style Mini-Trunks. 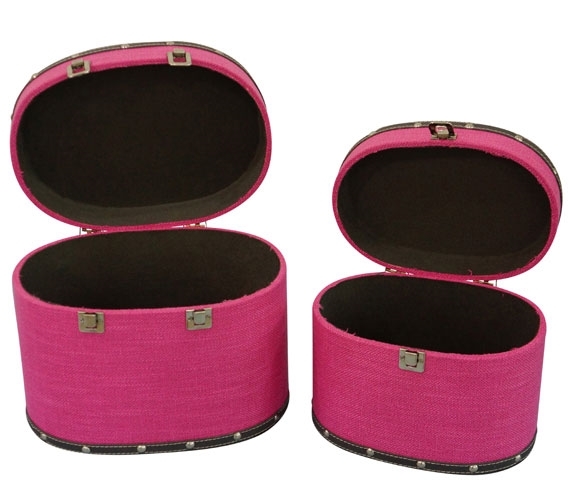 Our Fuchsia Pink Texture Rounded Style Mini-Trunks come in a set of two so you can have plenty of dorm room storage for those small college supplies you don't want to be without. The size and shape of these mini dorm trunks allow you to use your creativity with how and what you store. Each dorm trunk has a bright pink color that is gorgeous for dorm room decor whether you have a pink theme or are just adding a pop of that color. These dorm necessities will help you save space in your college dorm room and they are even extremely portable so you can take your art supplies to the park or your cosmetics to your family's home on a weekend trip to visit them.